Tired of using plain marketing tools to promote your brand? Want to try something new and different? Grab some circle business cards for a change! Business cards are a classic, and of course popular, way to promote your brand. If you want to stand out from the rest of the competition, try something different. Why not start with some circle business cards? This shape is popular with arts & crafts and food businesses. Round business cards are stylish and can give your ordinary business cards a fresh look. 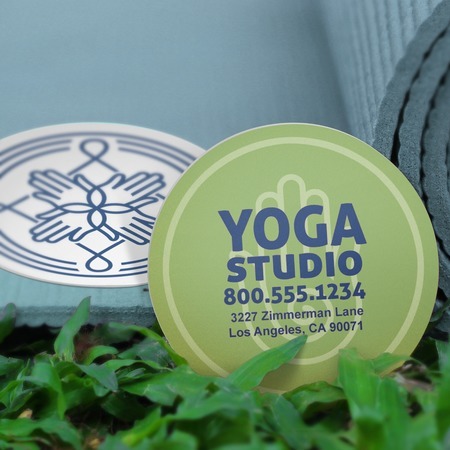 At UPrinting, you can have circle business cards in a 2.5” diameter printed on a 14 pt. cardstock (Gloss, Matte or High Gloss). Order from 25 to 10,000 pieces in 2, 4, or 6 business days!